Biitá'dah, "Almost the Top," was the spring and fall camp for the residents of Naschitti Chapter, who used to migrate up and down the Chuska Mountains with their flocks. These days, as in the rest of the Navajo Nation, you will find a large extended family here crammed into one house. But it wasn't so long ago many families in Naschitti Chapter had as many as four homes, each on a different "step" of the Chuska Mountains. "We migrated according to the seasons," explained Chapter Vice President Micheal Thomas Clani. "Now we live in one place, like the Pueblos." As the weather got warmer and the grass dried up in the lower regions, said local medicine man Steven Begay, the people would drive their flocks of sheep and herds of cattle from Haalghai (White Flats, the lowest level) to libaatah, the second level, a land of meadows alternating with stands of Gambel oak. The next level up, Biitá'dah, was the spring and fall camp, with its canopy of piñon and juniper. The height of summer would find the Naschittians and their flocks Biighaadi, at the very top -- almost 10,000 feet high, with a forest of ponderosa, aspen, Douglas fir and spruce. "If it was a very bad winter," Begay explained, "they would go all the way back to the plains; otherwise they might stay at the second level through the winter." There are still a few families who make the annual migration, but many people within this chapter halfway between Gallup and Shiprock learned early on the value of education and having paying jobs in one of the two cities. Or, they simply have moved there. 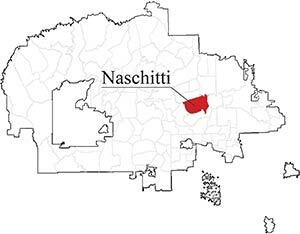 The chapter had 3,500 residents at the last census, but Clani estimates there's easily that number of Naschittians living somewhere else. "Our challenge is to create a quality of life that will bring them back," he said. Clani himself came back. The University of New Mexico business professor and co-founder of the American Indian Business Association says he's lived a lot of different places, but "Naschitti is the only place I feel right." He has some ideas to jump-start the economy, based on what's already here. Name: Oral history has it that a badger, Nahasch'i'di in Navajo, was digging near the wash and uncovered a spring of pure, fresh water, which people turned into a well. The water source is still used and Naschittians pride themselves on their sweet-tasting water. History: Archeological evidence indicates the corridor that is now U.S. Highway 491 has been a trade route since the Chacoan civilization built its several-story structures not far from here. 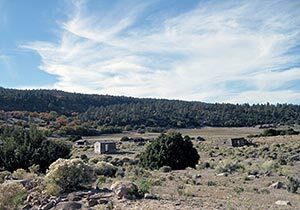 Naschitti is the halfway point between Gallup and Farmington, and has had a trading post since 1915. Dutch Reformed and Catholic missions followed, and the Bureau of Indian Affairs built a day school here in 1934. Land area: 188,000 acres. The borders are somewhat fuzzy depending on whether one uses the older BIA map or the one redrawn during the MacDonald administration. Major clans: This area was originally colonized by the Tábaahá and Ta'neeszahnii clans, but today 'Ashiihí, Kinya'áanii and To'áhání dominate. Points of interest: Kin Kazh, "Perfect House," an Anasazi ruin on the far eastern side of the chapter; Whiskey Lake and Long Lake; "The Golf Ball," a Federal Aviation Agency observatory on top of the Chuskas. Famous sons and daughters: Historically, one of the most interesting characters to come out of Naschitti was Asdzaa Hataal’, Woman Singer, who may have been the only medicine woman ever allowed to perform the Eagle Way, a traditionally male rite. It is said she could call eagles down from the sky. The great chief Narbona was also from here. In more modern times, the chapter has produced Bataan Death March survivor Neal Tsosie, Code Talker James Manuelito, chemist Stanley Edison and Myron Denetdale, who worked for NASA and took astronaut training but never was called on a mission. Contemporary figures include DNA Director LeVon Henry, former NHA head Chester Carl and former Antioch University president Cassandra Manuelito-Kerkvliet. Problems: Straddling two counties, two school districts and at the far junction of three Navajo Nation police districts, Naschitti finds itself in the middle of jurisdictional squabbles and without adequate police protection. With a traditional system of pasture rotation already in place, this chapter is less overgrazed than some of its neighbors, and there are still plenty of people making a living off their cattle. The 60-year-old Naschitti Livestock Association Cattle Auction would have been held this weekend, but it's been suspended for repairs to the facility. The auction, run by a non-profit organization of community members, is a good example of vertical integration -- taking control of all levels of producing and marketing a product, says Clani, who quickly catches himself sounding professorial and simplifies the lecture. But it could go further. "What about a (meat) processing plant?" he posits. "We could even have a steak restaurant." The flip side of Clani is Chapter President Hoskie Bryant. He comes from the previous generation to the 40-ish Clani, and while he's not as well spoken, he's clearly someone you don't want to mess with. It's Bryant who instigated the whole busing brouhaha that has roiled the community lately, with the simple suggestion that since a sizable minority of Naschitti students are choosing to attend schools in Tohatchi, the neighboring school district ought to come pick them up so they don't have to walk five miles to the bus stop. Bryant insists he had no idea he was going to set off a months-long turf war between the two school districts on either side of the San Juan-McKinley County line, one that would require intervention by state legislators and the Navajo Nation. "They're finally sitting down and talking," he muttered, "like they should have done in the first place." The chapter president is also chafing under "unfunded mandates" from Window Rock. Naschitti is certified and has been trying to transition to a representative commission form of government so it can take more control of its destiny and start collecting taxes, but its timing was lousy. It brought its request to Council after auditors had discovered that officials in Tuba City, which had transitioned to a alternate form of government, appeared to have embezzled $80,000. "They're using that as an excuse to not approve any more alternative governments," Bryant explained. "They're saying we don't need it now that they're decentralizing the tribal government." From an economist's point of view, Clani says it's not surprising that individuals are trying to capitalize on the chapters' new ability to collect taxes, but it shouldn't stop the Nation from progressing. It's only by exposing the problems that laws can be fine-tuned with more checks and balances, he said. "We're like teenagers whose parents don't want to give them the car keys, because they don't quite trust us yet," he said. "Changes in government are a messy and costly ordeal, but that's what it's going to be. Window Rock is trying to take control over an inherently messy and chaotic process." In Naschitti, however, Clani would like to put his MBA to work to make things a little less messy and chaotic. He'd like to confine ranching to range management units, sacrificing quantity for quality cattle that will fetch a premium price for the ranchers, and zone in housing, business and infrastructure for the people who don't necessarily want to run a ranch. Getting people to relinquish some of their cattle and traditional grazing land will be an uphill battle steeper than the Chuskas, he acknowledged. "If you ask people, 'Who will volunteer to give up some of your wealth and social status? '," he said, "Nobody's going to raise their hand. This is going to take generations." Begay, who says he's one of the last medicine men left in a community that used to be famous for its ceremonies, argues that the customary use areas are what make Naschitti, Naschitti, and they do provide a certain amount of order. "The routes up the mountain and the pastures are separated by clan," he said. "I wouldn't think of taking out a homesite lease on another clan's customary use area, and I wouldn't like it if somebody did that on mine." Bryant believes that, like the busing issue, this conflict between the traditional and the modern can be resolved by talking. He's planning a series of community forums. "We need to have the (grazing) permittees and the non-permittees come together," he said. "What do they want for their children? We've got all this land and space -- how can we all succeed where no one will be left out?"